In Jewish tradition saintliness ("ḥasidut") is distinguished from holiness ("ḳedushah"), which is part of the Mosaic law. Saintliness is a divine and lofty type of piety, and a higher morality, not bound by law. Saintliness is "in front [outside] of the law boundary" ("lifenim mi-shurat ha-din"). Saintship ("middat ḥasidut") is distinguished from mere obedience to the Law (B. M. 52b; Ḥul. 130b). The Rabbis' conception of saintliness may be gathered from their description of Biblical and Talmudical personages styled by them "saints." R. Meïr thought that "Adam was a great saint. Knowing that he had caused death to mankind, he fasted daily for 130 years, ceased cohabitation, and covered his body with fig-leaves" ('Er. 18b). Another saint was David, who prayed, "preserve my soul, for I am a saint" ("ḥasid"; Ps. lxxxvi. 2, Hebr.). The Talmud justifies David's self-praise by comparing him with other kings, who slept till the third hour of the day, while David arose at midnight to give thanks unto God (Ps. cxix. 62; Ber. 4a). 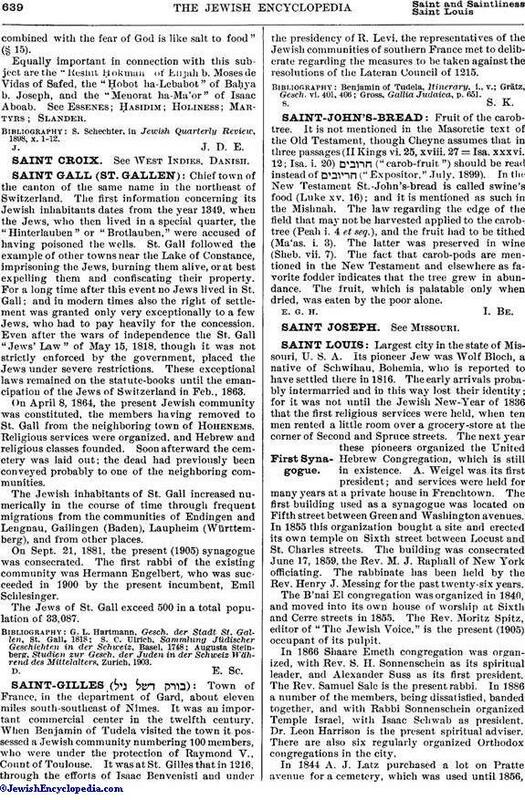 Job is counted as a saint of the Gentiles (B. B. 15b). One of the attributes of God is "ḥasidut" (saintliness). The Talmud interprets the verse "The Lord is righteous in all His ways, and saintly in all His deeds" (Ps. cxlv. 17, Hebr.) as follows: "At the beginning He is righteous [within the Law], and at the end He deals outside the legal line [if the world can not exist by the strict enforcement of the law and requires the administration of His mercy and saintliness]" (R. H. 17b, and Tosef. ad loc.). The Talmud recognized the "early saints" ("ḥasidim ha-rishonim") as a few elect ones, perhaps one or two in a generation (comp. "the saint of the generation"; Ta'an. 8a). This class became extinct in the tannaitic period with the death of R. Jose, a disciple of R. Johanan b. Zakkai (Abot ii. 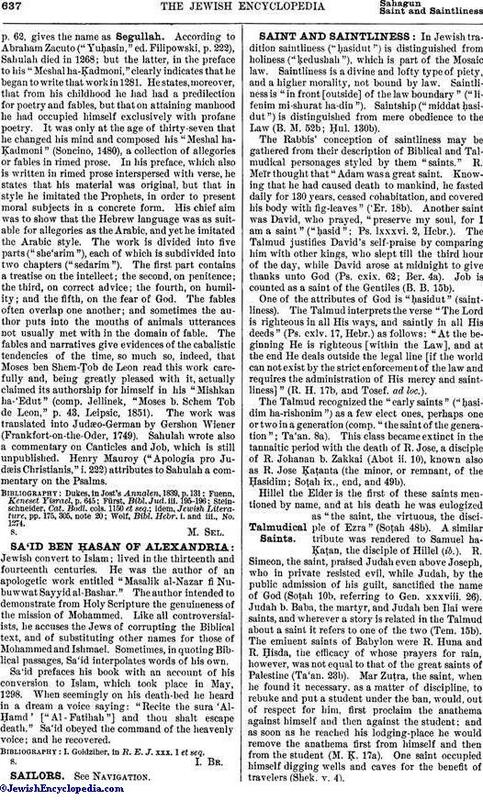 10), known also as R. Jose Ḳaṭanta (the minor, or remnant, of the Ḥasidim; Soṭah ix., end, and 49b). Hillel the Elder is the first of these saints mentioned by name, and at his death he was eulogized as "the saint, the virtuous, the disciple of Ezra" (Soṭah 48b). A similar tribute was rendered to Samuel ha-Ḳaṭan, the disciple of Hillel (ib.). R. Simeon, the saint, praised Judah even above Joseph, who in private resisted evil, while Judah, by the public admission of his guilt, sanctified the name of God (Soṭah 10b, referring to Gen. xxxviii. 26). Judah b. Baba, the martyr, and Judah ben Ilai were saints, and wherever a story is related in the Talmud about a saint it refers to one of the two (Tem. 15b). The eminent saints of Babylon were R. Huna and R. Ḥisda, the efficacy of whose prayers for rain, however, was not equal to that of the great saints of Palestine (Ta'an. 23b). Mar Zuṭra, the saint, when he found it necessary, as a matter of discipline, to rebuke and put a student under the ban, would, out of respect for him, first proclaim the anathema against himself and then against the student; and as soon as he reached his lodging-place he would remove the anathema first from himself and then from the student (M. Ḳ. 17a). One saint occupied himself digging wells and caves for the benefit of travelers (Sheḳ. v. 4). The piety of the early saints is mentioned but once, on which occasion they are referred to as waiting one hour before they prayed, in order to collect their thoughts and concentrate their minds upon the Father in heaven (Ber. v. 1). The early saints discouraged fasting in connection with prayers, as it caused physical pain. Resh Laḳish cited, "The merciful man ["ḥased" = "ḥasid"] doeth good to his own soul [life]: but he that is cruel troubleth his own flesh" (Prov. xi. 17; Ta'an. 11b; see Tosef. ad loc.). Saints were in higher esteem than men of great learning. There were separate burial caves for saints and for the dayyanim; when a certain rabbinical student of ill repute died he was not allowed burial in the cave of the saints, but was interred in the cave of the dayyanim (M. Ḳ. 17a). The saint, however, must be equally a man of wide learning. An "'am ha-areẓ" can not be a saint (Abot ii. 6). It is dangerous to live near an ignorant saint (Shab. 63a; Rashi ad loc.). The "ḥasid shoṭeh" (foolish saint) is classed with the scheming villain and the celibate woman; all of them are destructive elements of the world (Soṭah v. 2). A foolish saint is defined as "one who would see a woman drown without going to her rescue because of the rule forbidding a man to look upon a woman" (ib. 21b). Saintliness, according to R. Phinehas ben Jair, is the highest perfection, and the successive stages by which it is reached are the following: study of the Law, energy, cleanliness, separateness (individuality), purity, modesty, fear of sin, inspiration, and capacity to bring about resurrection ('Ab. Zarah 20b). The question "How can one become a saint?" is answered in various ways in the Talmud. R. Judah says one desiring to be a saint must be careful to observe the laws of tort ("neziḳin"). Raba (Rabina) says one should be careful of matters in the code of "abot"; others say, in matters of thanksgiving and benedictions ("berakot"; B. K. 30a). It appears that R. Judah's answer is the key to early saintliness, the fundamental principle of which was not even the morality that was common to every righteous man, but the determination not to do an injury or cause damage to a fellow man. "Mine and thine" was interpreted by the saint, "Thine is thine, and mine is thine" (Ab. v. 13), inasmuch as he sacrificed his own for the sake of guarding the property of individuals and of the general public. A story is told of a man who cleared his private premises of stones and rubbish and threw them on public ground. A saint passing by said to him: "Fool, why dost thou throw stones from premises that do not belong to thee into premises of thine own?" The man only laughed at him. In a short time, however, the man was compelled to dispose of his property, and as he passed along the public premises as he slipped on the very stones he had cleared from his former property. He then acknowledged the wisdom of the saint (B. Ḳ. 50b). The early saints buried thorns and broken glass three handbreadths deep in their fields to prevent a possible injury to any one through stepping on them (B. Ḳ. 30a). The saint burned the parings from his finger-nails (B. M. 18a), evidently considering them poisonous and likely, if not disposed of, to come in contact with food. A story is told of a saint who suffered from heart-disease and whom the physicians ordered to drink hot goat-milk every morning, telling him that other-wise his ailment would prove fatal. A goat was accordingly tied to the foot of his bed, and the saint drank its milk as prescribed. But when his colleagues visited him and saw the goat, they stepped back and exclaimed: "Here he keeps an armed brigand and shall we visit him?" (the raising of small cattle like goats and sheep was prohibited in the populated places of Palestine because they roam at large and damage private property). Although some of the Rabbis had permitted a goat to be kept tied in the house, and although this was a question of life or death, the saints regarded the goat as a high-way robber and sent it away at the risk of life (B. Ḳ. 80a). A saint would not interfere in any way with a mendicant's right to beg. Once a saint who was accustomed to see and converse with the spirit of Elijah missed his visitor from the time he built a keeper's inn at the entrance of his courtyard, and which interfered with the free entry of beggars (B. B. 7b). The saints, after the early class had passed away, were mostly of the type described by Raba, or Rabina—renowned for their high morality, extreme piety, and rigid punctuality in prayer and benedictions. Their moral ideas are summarized in Raba's injunction, "Sanctify thyself even in that which is permitted to thee" (Yeb. 20a). The Torah in certain cases made concessions to human weakness, as in the case of the captive woman with whom marriage was permitted (Deut. xxi. 11). "The Torah provided against the 'yeẓer ha-ra''" (the natural, evil inclination; Ḳid. 21b, end). "Take no oath, even to speak the truth, as the name of God must not be mentioned in vain" (Ned. 8b). "Keep thee from every wicked thing" (Deut. xxiii. 9) is interpreted by R. Phinehas b. Jair as a command not to think of impure things during the day (Ket. 46a). Impure thoughts are even worse than impure acts (Yoma 29a). Purity of heart was the ideal of the saint, who was particularly severe against slander. R. Judah ben Samuel he-Ḥasid of Regensburg was, perhaps, the best type of the saints of the Middle Ages. His ethical code, "Sefer Ḥasidim," is full of methods and regulations for his class. Among the rules for saintliness are: "To be ready to forgive the wrongs done by those who ask forgiveness" (§ 11). "To restrain oneself from doing evil, not because of fear of punishment, but for the reverence and love of God" (§ 12). "To be cheerful and greet every person in the street, even a Gentile" (§ 13). Others of his maxims are: "The study of the Law alone is not enough without good deeds; it is like obtaining the keys of the inner chamber without the keys of the outer chamber: how shall one enter? (ib.). "The love for God shall be above any human love, as for wife and children; one shall be ready to sacrifice his life for God's commandments" (§ 14). "Modestycombined with the fear of God is like salt to food" (§ 15). Equally important in connection with this subject are the "Reshit Ḥokmah" of Enjah b. Moses de Vidas of Safed, the "Ḥobot ha-Lebabot" of Baḥya b. Joseph, and the "Menorat h-Ma'or" of Isaac Aboab. See Essenes; Ḥasidim; Holiness; Martyrs; Slander. 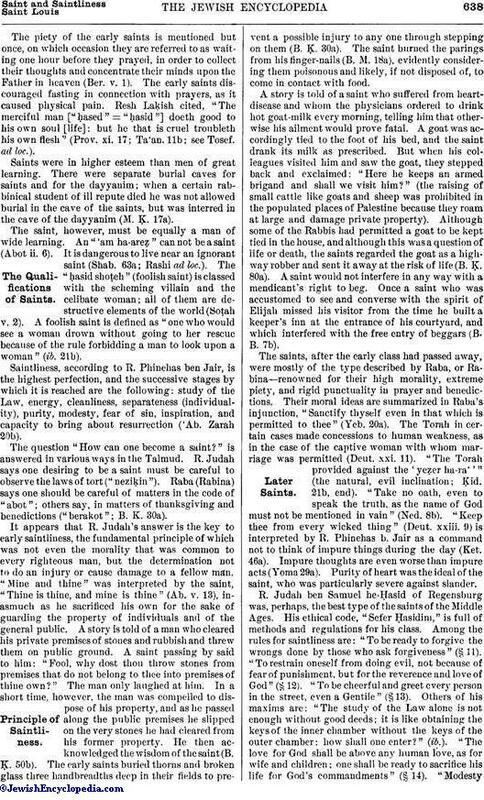 S. Schechter, in Jewish Quarterly Review, 1898, x. 1-12.